The energy from the sun makes our Earth work. Without it, we wouldn’t exist. However, that same energy, in the form of heat and ultraviolet (UV) radiation, can do great harm to you and your equipment. The main things you need to be concerned about with your inflatable boat’s relationship with the sun are overinflation caused by heating of the air in the tubes and material damage from UV radiation. 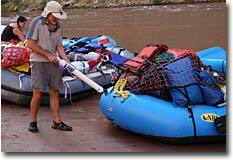 It made sense, so we filled the Otter again, in the morning when it was cooler, with a hand pump and put it out in the sun again. The day was cooler, in the lower 80s. Sure enough, the pressure went up to 4.0 psi quite quickly. And, of course, this wasn’t even a true duplication of what typically happens with your inflatable. 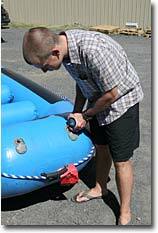 You inflate it on-shore and then put it in the water. The water is usually colder than the air temperature, so you top it off to get the right psi for on-the-water rigidity. Later in the day, with the sun out, the pressure goes up. As long as you’re on the water, with a modern, well-built boat, that’s not a problem. However, when you pull up on shore for a long lunch stop or in the afternoon to camp, your boat is in danger. Part of the boat is out of the water, it’s not getting splashed and pressure can build dramatically. Cool, dense air filled the chambers. Now, the sun beating on the boat expands the air inside and soon pressure can build to the point of weakening or rupturing the boat’s material. Don't take a chance; you may find that the manufacturer of your boat will not warranty damage caused by explosive decompression caused by overinflation. So what’s the safest solution? Get a good pressure gauge, and use it regularly to ensure your boat stays at a safe pressure. The K-Pump Kwik Check Gauge is an excellent one. It fits a wide variety of different valves and holds the pressure taken until the pressure release button is pushed. A safe pressure depends on the construction of your boat and the manufacturer’s recommendation. We recommend 2.5 psi as an operating pressure for NRS boats. This gives you a good, rigid hull that won’t “taco” or buckle in a rapid. Whereas our boats can safely take much higher pressure, we strongly recommend keeping them as close to that pressure as possible. Inflating them to a higher pressure doesn’t give you better performance, so why risk damage from overpressure? On a hot day, let air out of the tubes when you’re pulled up on shore. And let air out of the various chambers evenly, to avoid putting undue pressure on interior baffles. That’s one of the reasons you need to pack a hand pump with you, even on day trips. Ultraviolet radiation from the sun can really beat up your gear. As UV is absorbed, it starts to break chemical bonds in materials. This leads to cracking, brittleness, fading and discoloration. Fortunately, there’s an easy solution. 303 Aerospace Protectant is like “SPF 40 Sunscreen…For Your Stuff.” 303 contains no petrochemicals or silicone oils. It works great for UV protection, and it is safe to use on rubber, vinyl (PVC), gelcoat fiberglass, plastics, finished leathers and many fabrics. It’s a great product – non-toxic, non-flammable, safe and easy to use. Protect Yourself – info on sunscreens and sunglasses.